Are you a comparison shopper? Today, more than ever, we check out what others are saying about restaurants, hotels, cars, and products, before we choose to invest our time and money. This is an important step to ensure that your experience with a product or service is positive. This practice is even more important when it’s applied to your health, dental and otherwise. Piney Point OMS is the leading oral and maxillofacial surgery center of Houston, and we have the patient reviews to prove it. Dr. Koo has over 40 5-Star Google reviews. 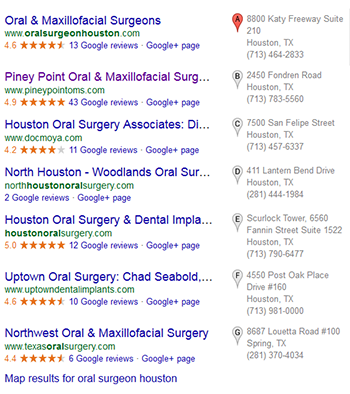 That’s more positive reviews than any other oral and maxillofacial surgeon in the greater Houston area. Don’t take our word for it, read some of the Google reviews below, and then make an appointment with the premier dental implants destination of Houston, Piney Point OMS. Dr. Koo is a trusted, experienced, and affordable oral and maxillofacial surgeon. The friendly oral and maxillofacial surgery team at Piney Point OMS delivers quality care daily throughout greater Houston, TX, including: Stafford, Meyerland, Bellaire, Lamar Terrace, Galleria, Briargrove, Rice Military, Heights, Bunker Hill Village, Hunters Creek Village, Hedwig Village, Katy, and the surrounding communities. What Are Patients Saying About Dr. Koo and Piney Point OMS? There’s no doubt that you will be more than satisfied with the quality care you’ll receive from Dr. Koo and the Piney Point OMS team. Schedule your oral and maxillofacial surgery appointment with the best reviewed oral and maxillofacial surgery practice in Houston, Piney Point OMS. Dr. Koo and the talented oral surgery team at Piney Point OMS proudly serve patients daily throughout greater Houston, TX.